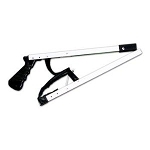 Ordering Options: Standard - 24" Long - 30" XL - 36"
The Lightweight Handi-Reacher from IndeMedical.com has an ergonomic trigger that is operated with the whole hand. It is constructed with wired-driven jaws and the frame resists twisting and bending. It includes magnet for picking up metal objects and a hook to aid with dressing. These reaching aides assist individuals with limited reach and hand strength. 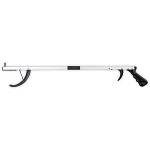 PikStik TelescoPik Reacher, 30" - 44"